Excitedly and sadly, we are approaching the midseason finale of “Once Upon a Time.” As we reach this point, more spoilers and sneak peaks are revealed. Adam Horowitz and Edward Kitsis sat down with TVGuide.com for a Lightning Round session. If you are afraid of spoilers, stop reading now. Was it always known that Peter Pan (Robbie Kay) was going to be Rumplstiltskin’s father (Robert Carlyle)? Will fans see how Micheal (James Immekus) John (Matt Kane) and Wendy (Freya Tingley) attempted to beat Pan in the past? We will get a glimpse at what Rumple is going through inside Pandora’s Box? Will we learn more about Henry’s history in season three? Adam Horowitz: And the first at it is soon. It was brought up about having another child, will Emma (Jennifer Morrison) and Snow White (Ginnifer Goodwin) talk about this? In the past, Emma went to jail for Neal (Michael Raymond-James). Will Snow and Charming (Joshua Dallas) find out about this? Will we learn more about how Regina’s (Lana Parrilla) decision to not meet Robin Hood (Sean Maguire) affected both of them? Is Tinker Bell (Rose McIver) and Belle (Emilie de Ravin) connected? 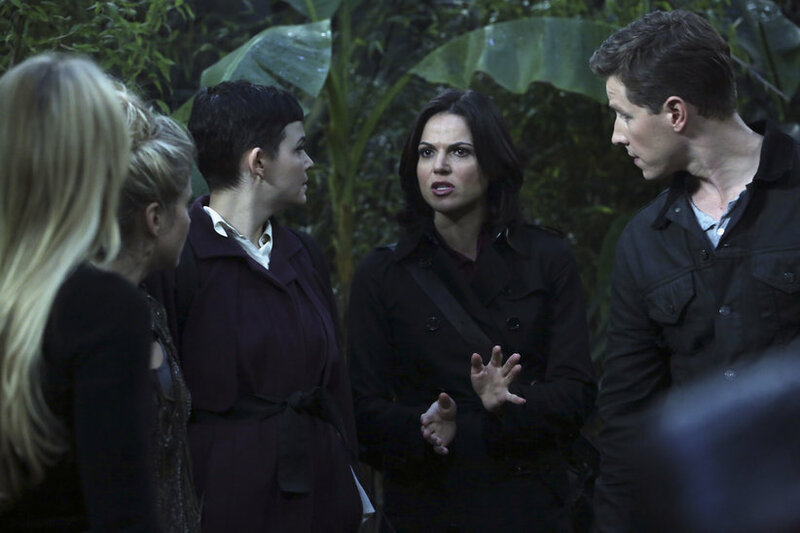 Adam Horowitz: Besides, their names rhyming, they are not part of the Bell family. It is a clever idea, but not the case. Will Ursula (Yvette Nicole Brown) appear again this season? Will Pincochio (Eion Bailey) show up again? Will we learn more about Emma’s foster home experience as a child? Will we learn about Emma’s last name, Swan? With Emma exploring magic more, will Dark Magic, just like Rumple and Regina, tempt her? We saw before that Emma’s heart could not be ripped out of her. Was Henry’s heart able to because he did it himself? Will Henry learn that Regina erased his memory when she told him how she was going to let everyone die? Can a shadow go back and join its host? Will we see more worlds explored the second half of the season? Adam Horowitz: Never say never. We have no immediate plans. Edward Kitsis: We tried to do one for Comic-Con, but it become cost-prohibitive.